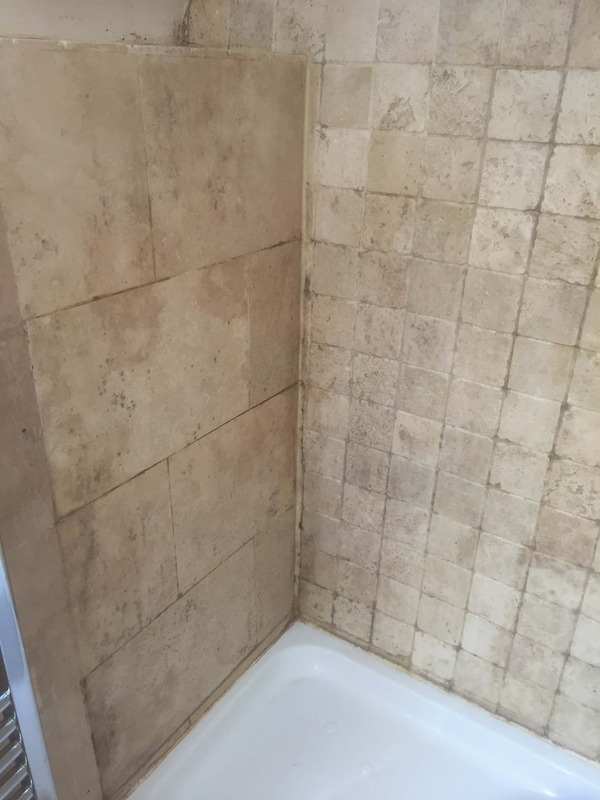 This shower cubicle at a house in the historic market town of Abingdon on Thames was tiled with Travertine which with use had become grubby and the grout darkened. The properties in the road were of a similar age and many bathrooms had been upgraded in recent years to make them more modern. This one was no different having been fitted a few years prior. Travertine is a natural stone material that has unique features and colouring that no other stone can offer. The distinctive design and natural patterns found within Travertine make it very popular choice in bathrooms, where it gives a luxury hotel style feel. It does however need to be maintained if you want it keep that luxury appearance and unfortunately due to the English climate and a general lack of adequate ventilation its quite common for them to attract mould and become stained with dyes from soaps and shampoos. The good news is we have a number of tools and products that we can use to restore their appearance, so they look like a new installation. The main problem was the grout which was badly discoloured. To tackle this the Travertine and grout was sprayed with Tile Doctor Duo Clean and then scrubbed in with a hand brush to remove the mould and ground in dirt from the grout, I then rinsed with water. Duo Clean is a fast and effective double action grout cleaner and mould remover. It cleans up grout and can also remove mould and blackspot from the grout and silicone and it is versatile as it suitable for use on plastic and enamel baths and showers and will not cause any damage to them. To restore the appearance of the stone I set about re-honing the Travertine tiles using six-inch diamond burnishing pads fitted to a hand buffer. The pads are applied in sequence starting with 400-grit, moving onto 800-grit and finishing with 1500-grit. Applied with water which acts as a lubricant, the process deep cleans and tightens the pores in the stone to improve overall appearance. The tiles are rinsed with water after each pad is applied to remove the soil that is generated. Another issue was the silicone strip between the wall tiles and the shower tray which was looking very mouldy and black. Using a sharp knife this was removed and replaced with fresh white mould resistant silicone. Once the shower area was dry the Travertine wall tile and grout were then sealed with a couple of coats of Tile Doctor Colour Grow. 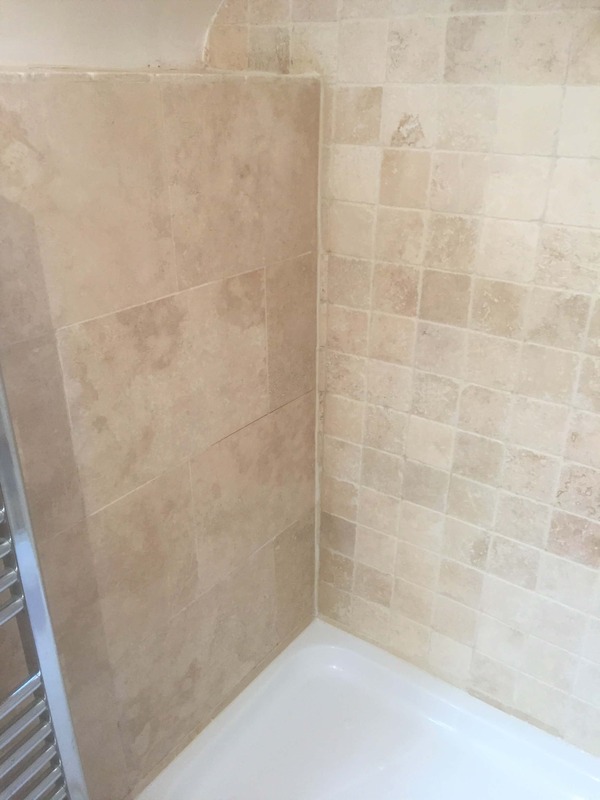 This adds a preventative barrier over the tile and grout allowing water to easily run down the wall, it also improved the appearance of the stone and enhanced the natural brown colours in the Travertine. The customer was very happy with the shower room, it looked much more inviting and they were surprised that I had managed to restore it to the way it looked when it was originally installed.